Hello, I’m Cathé, and I have a three-and-a-half-year-old son (Hi, Cathé!). I love him. But recently, we have had to come home from errand runs early simply because he will stop holding my hand in the parking lot and run off, not keep his hands to himself (in an aisle of glass at a store), scream and hit when he doesn’t get something he wants, or other embarrassing behaviors that I never thought my children would exhibit in a million years. Also, if I hear the word “no” in a whiny tone one more time! I know I am not alone. I recently attended a BBQ where the parents of a handful of boys (between the ages of 3-and-a-half and 4-and-a-quarter) handed each other another beer and talked about the embarrassing similarities in our boys’ behavior. I came home that evening to an email from a co-worker asking for help with her little boy who was acting in the same manner. 1. Take pictures. Laugh. Delete the pictures…or make a blog: We’ve talked about Why My Son Is Crying. Love it or hate it, the idea of taking pictures during the not-so-happy times can serve a humorous purpose at a later time. For instance, on your son’s wedding day, bring out the bath pictures and the tantrum photos. Okay, maybe that is cruel. But, if you ever have grand-kids who are in trouble with mom and dad, you can show them that dad had hard days too. 2. Drink: I have heard several parents recently say they never imbibed in booze until they had a three-year-old son. If you like wine, there are geeky varieties for almost any fan. If it is a mixed drink you are looking for, I have a board on Pinterest and there are books available . 3. A Fence: This can be a very geeky way to survive your energetic child. 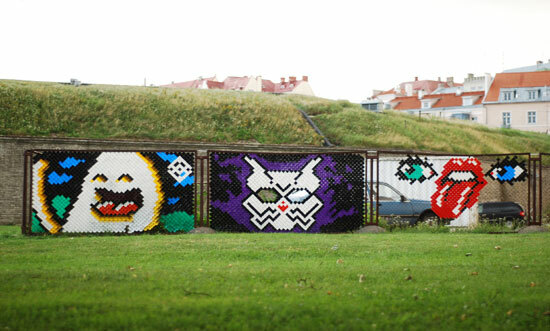 If you have a chain-link fence, you can use Fence Weave to create any 8bit design for a colorful enclosure. Otherwise it is still nice to know that if you let your child loose so you can regain your sanity they will at least be contained. MVP is more than happy to mail himself somewhere. 4. Boxes: Put your kid in them, tape them up, and address them to Abu Dhabi like Garfield used to, or let your kid go crazy with the green finger paint so he can pretend he’s the Hulk and smash the box to bits. It’s amazing how fifteen minutes with an educational app can slow down a little body. 5.Tablet devices: Screen time is a big deal to many parents. But that screen time can also make the difference between meltdowns and angelic behavior on a shopping trip. One GeekMom spied triplets who each had their own iPad Mini on a shopping trip. I even turn to technology like my Kindle to give to my three-year-old in a pinch; this includes keeping him from taking a nap so he sleeps at night, and keeping him from touching all of the trophies at the Taekwondo studio his sister attends. 6. Snacks: If your kids are anything like mine, they graze all day. Enough kids out there graze that there is now a service for it. Yes, Graze is a service where a box of healthy snacks shows up at your house for as little as $5. Other geeky snacks can be found out there. There are Pinterest boards, so they must be real. 7. A garden hose (and other cheap water play): Getting into geekery of the maker variety, you don’t have to have a real Slip N Slide or kiddie pool to have the geekiest and wettest yard in the neighborhood. You can make a splash pad, a kid wash, or even throw in a bit of science with the color spectrum. 8. Broken gadgets: One GeekMom keeps broken gadgets so her kids can go to town with that screwdriver without caring if the device is put back together. There are also books available with ideas on what to do with your broken computer and other gadgets. Ready! Set! Jump! The kids love jumping on this “crash” cube chair. 9. Save the furniture! : Autism furniture is a great way for kids who have to spend a lot of time indoors from destroying your furniture. One GeekMom recommended a swing that hangs from the ceiling. We have ceiling heat so we have pillows instead. The rule in our house is you sit correctly on the couch, and the coffee table is for eating at. If you want to jump on the furniture, you go to the crash pillow (we purchased from a local company) and get the jumping out of your system. It has worked so well that we asked Santa for a cube last year that has been very popular. We love the autism furniture because it is extremely durable. You don’t need to have an autistic child to appreciate the furniture. Decorate a kitchen timer with geeky stickers. Set it for a reasonable amount of quiet time. 10. A kitchen timer: Yes, a simple and loud kitchen timer can save you for up to an hour! My husband received a bell timer for his birthday a few years back. We slapped some Mario stickers on it and mounted it between the kids’rooms. When quiet time is needed, we set the timer for anywhere from five to thirty minutes. When the bell rings, the kids can come out of their rooms. Oh yea—we make them try to go potty before we stick them in their rooms so there are no excuses for coming out early! Do you have (or have you had) a 3-year-old that’s driving you crazy? Have you tried any of these methods or have any of your own? Let us know in the comments! On the subject of water play, I got these plastic droppers for the kids and my 3 and 5 year old loved using them to transfer water or to mix watercolors. http://www.discountschoolsupply.com/Product/ProductDetail.aspx?product=106&keyword=PLASTIC%20DROPPERS&scategoryid=0&CategorySearch=&Brand=&Price= I think sometimes the best thing about connecting with other parents going through similar ages and stages is that you get to see that it is something to forge through. I imagine it is hard to feel bigger, stronger, and more able and then have parents telling you that there are boundaries. Or to not draw on walls. Sigh.